An example of the pop-up warning in question. You might be familiar with the feeling: you go into a purchase with a plan of exactly what you want to buy. No frills, no fuss, no muss. But then, suddenly, you find you’re shelling out more money than you’d planned, perhaps after encountering some persuasive sales tactics. A passenger rights group says Delta Air Lines is employing shame as a method to get travelers to buy ticket upgrades they might not have wanted initially. Upselling, as its known, is the practice of convincing customers to buy perks or extras not included in a base price. In the airline industry, these add-ons can be anything from a wider seat or more leg room, to priority boarding and free ticket changes. But flyersrights.org, a nonprofit group that advocates for passengers, is calling Delta out on its tactics to get people to buy those extras. On Delta’s website, choosing a basic economy fare will bring you to a final page to confirm your purchase, notes the Los Angeles Times. Listed there are several consequences of buying the cheapest ticket: You’ll be last to board, meaning the last to find overhead bin space. 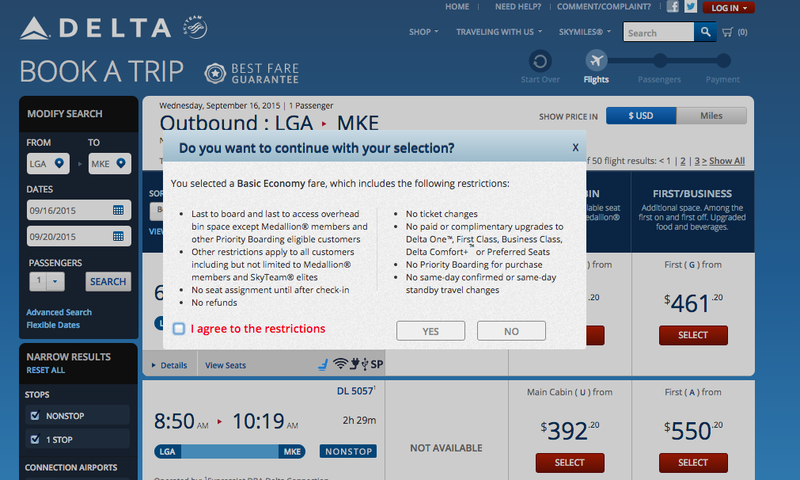 You don’t get a seat assignment ahead of time, there are no refunds or ticket changes and no stand-by travel changes. The president of the passenger rights group says the practice is like when a car dealer pressures buyers into tacking on expensive upgrades to a basic car model. “If it works, other airlines will likely try to follow,” Paul Hudson told the LAT.